Overview of my aesthetic: My final design project has a kinetics/movement aesthetic. I got a lot of feedback on my aesthetic, and felt the need to dive a little deeper. Through my aesthetic research, I found many examples of artists who used kinetic construction to form the kinetic aesthetic of their art work. One of the main artists that sparked my inspiration for an art piece was Man Ray and his piece Obstruction from 1920. This piece can be seen below. As seen, this art piece would show an organic kinetic aesthetic through natural disturbances. Other more relatable examples include kinetic machines located in the ITLL lobby and walkways. Inspiration: I will be adopting the kinetic/movement portion of this aesthetic, but I will make my kinetics driven through a DC motor instead of natural disturbances. If I have time, I will dive into the lumino kinetic aesthetic and add lighting to the base of my project. Below is a preliminary sketch I created. Sketch Explanation: As shown above, I will be making a kinetic sculpture that is driven with a DC motor. There will be 4 sets of disks on the motor varying in size. I have uploaded a sketch of the blade below which I made in SolidWorks. The first 3 blades will contain slots in them with polycarbonate spacers in between. To ensure the blades move together, dowel pins will be press fit into each one. Additionally, the smallest blade in front will be the driving disk which will hold a jam nut on the very end. The purpose for the jam nut is to lock the shaft in place and then slide along the slot in order to separate the disk’s starting points. This will also mean that the design will be reversible in terms of direction. Prototype Below includes ideas of a moiré aesthetic. I really like this idea and the aesthetic it creates. It’s similar to the shadow art project but has it’s own flare. The rotational aspect is awesome! Really cool idea! I like how you are adding a dynamic element to something so often thought about as static. I’m excited to see how it turns out. I look forward to seeing the final assembly! I like the idea of using a motor to really make the project dynamic. Have you thought about what kind of motor will work for this yet? Hope assembly goes smoothly. It’s an interesting idea to combine Mori aesthetic in your project. 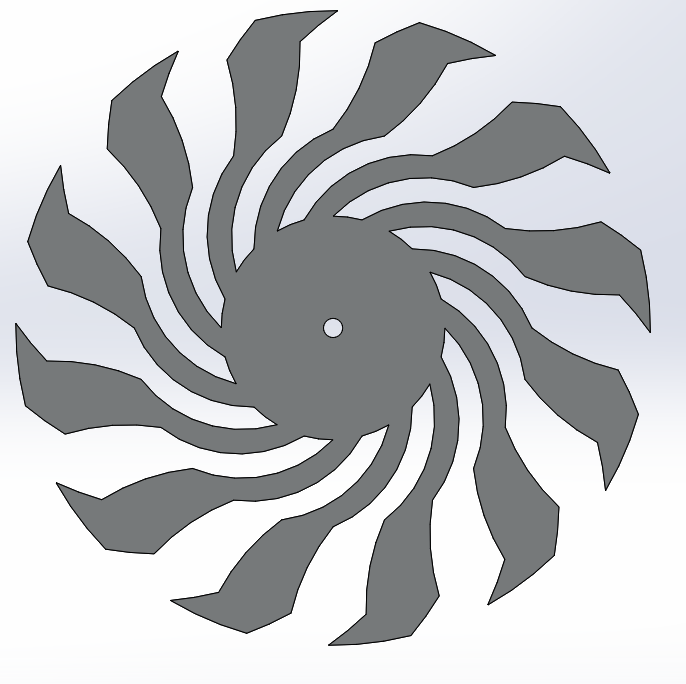 For the blade, multiple layers of blades add a sense of aesthetics in your project. Clare, this is a super interesting project. I love the kinetic aspect of this and use of engineering skills to create an artifact. It’s really cool how you use your machining skills and manufacturing knowledge in these projects. The psychedelic morier(?) design of the overlapping cutouts creating a dynamic design is very cool and mesmerizing. Excited to see how this comes out. Really cool project! I think it will be perfect the way it is. I’m excited to see it. Good Luck! This is a really cool idea! One thing that I think would add to the aesthetic of the overlapping discs would be to apply a different stain to each wooden disc. I think that would really create a cool effect to the overlapping aesthetic. I like how your design is a combination of different aesthetics in one artwork. Your project is not only thought-provoking for its sharp angles, but for the different shapes that it makes as its rotating. Have you considered adding colors to the shapes? That would make the shapes pop out and the viewer will notice the shift while it’s rotating.